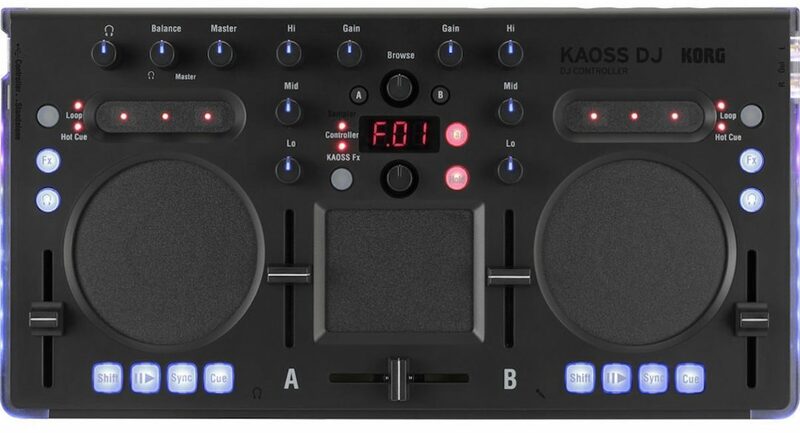 The Korg KAOSS DJ puts a KAOSS Pad right in the middle of the controller for touchpad effect tweaking. As a standalone mixer, Serato DJ controller, and hardware KAOSS FX box, it’s certainly something different! It has a host of potential uses for the working DJ, from Serato backup controller, to centrepiece of hotel room jam sessions, to mic & FX preamp, and send/return FX units. While maybe not good as a first controller, it’ll fit right into the workflows of many Serato DJs, who may find themselves using it for all of those things at one time or another. The top of the unit, showing a pretty standard controller layout but of course with that KAOSS FX pad right in the middle, and touchpad jogwheels instead of mechanical ones, too. One controller that immediately springs to mind on looking at the Korg KAOSS DJ is the now-discontinued Stanton SCS.3DJ System. That was an ambitious but ultimately flawed DJ controller that actually comprised of two “decks” and a “mixer” (the “mixer” was only a software mixer) that bolted together to make a unit that was bigger and heavier than the little Korg, but shared the same touch-surface “jogwheels” you see here. For the time, it was extremely innovative. However, this tiny Serato DJ device (it’s sold to work with Serato DJ Intro which is in the box, but you’ll want to upgrade to Serato DJ) has two massively interesting twists. Unlike the Stanton system, it has an audio interface built in. And unlike pretty much every DJ controller at the lower end of the market, it is also a two-channel standalone mixer (round the back are twin RCA inputs for CDJs, MP3 players and so on, and the 1/4″ mic socket on the front can also be routed through one of the unit’s two channels via a switch on the back). Finally, unlike absolutely all other DJ controllers, at any price point, this unit has a final twist: It has Korg KAOSS FX built in. That means proper hardware effects that can be used without a computer being plugged into it if you so wish (they can also be used when the unit is running as a DJ controller), which is what the tiny LED screen and touchpad in the centre of the unit are for. The rear of the unit, showing the twin RCA inputs, the mic gain, and a small switch to turn one of the standalone channels into a mic channel. To set it up as a DJ controller, you install Serato DJ Intro (plus driver for PC users), and plug it in to your computer with the supplied USB cable. Before doing so, you need to put the “startup mode” switch on the left side to the left. If you want to use it as a standalone mixer, you need to power it down (ie unplug the USB cable) and put the same switch to the right, before plugging in again, using any suitable USB power source. Your mic and headphones plug in to the front, and the twin RCAs on the right-hand side take the cables that go off to your speakers, and you’re ready to go. Everything you’d expect from a basic Serato DJ controller is here – library browse, transport, loops, hot cues, workable (although touch sensitive) jogwheels/pads, a little strip for nudging (that’s also where the loops and cues are, on a modifier button), plus the usual headphones, master and headphones mix controls. They’ve bothered to add gain on each channel (more than some controllers twice the size), and while there’s no overall backlighting so using it might be a struggle in really dark clubs, the controls all have LEDs in them that light when the controls are set centre, which is a nice touch. The buttons do have blue state-dependent backlighting too. It’s not for turntablists, controllerists or power users, but for performing a basic DJ set (for instance as a second controller, or a portable controller to play with Serato anywhere) it’s more than fine. Oh, and the VU meters are blue and run the whole left and right side of the unit – they’re cool! Plug the USB cable into any USB power source, and it is a full standalone two-channel mixer. You can plug two line inputs in (no record decks though), and also a microphone in to the 1/4″ TRS on the front, which can be switched via a switch on the back to use one of the line inputs. 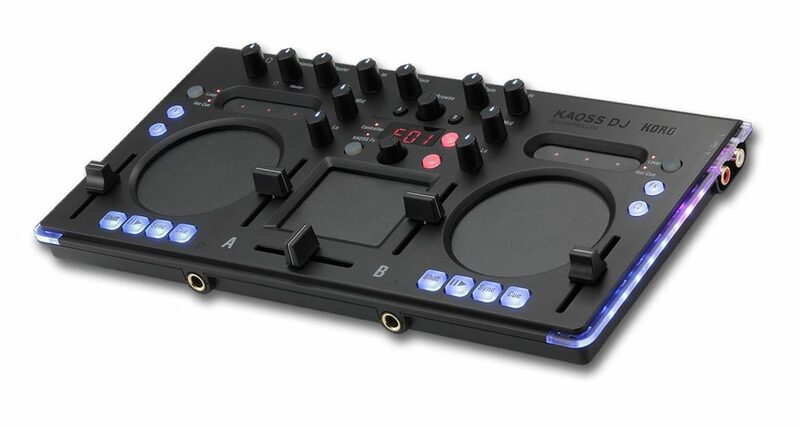 Yup, doesn’t matter whether you’re DJing with Serato via software, or using any other of the inputs to put sound through this unit, the pad in the middle lets you apply and control Korg KAOSS FX just the same. The small LED display cycles through the various types (washes, “slip”-type effect, lead effect, pads and so on), and they range from basic filters, echos and the like right up to scary lead synthesisers that sound like Gary Numan had a part to play in designing them. There’s no point trying to describe them here, so take a look at the video below for a demo of some of these. Suffice to say they’re really high quality, and ought to give the creative/musical DJ a lot of fun – although as with all such features, less is always more! You can, by the way, also use the pad to control Serato’s built-in FX, at least in a limited fashion. They’re all post-fader, too, which is always a plus point. It’s hard to know what to think of this. There’s just so much going on. I mean, as a tiny two-channel mixer alone, it’s a good thing to have. You could use it at any club gig as a send/return FX unit, because the Korg FX sound wonderful, especially when you get up into the synths – you could really differentiate your DJ sets with them. On the Serato side, it shines because it’s so portable. Remember, Serato DJ doesn’t “work” unless a controller is plugged into it. With this thrown in your bad alongside your MacBook or MacBook Air, you have a fully functioning Serato DJ set-up, for practice anywhere. Of course, as a back-up Serato controller, it also scores highly, due to being so portable. Oh, and those big, blue, flashing VU meters up the side are just damned cool. All that said, as an only (or first) controller, it makes less sense: It’s fiddly, and touch-surface jogwheels are never going to feel like the “real thing”. I think the needi to power off and on again to switch from Serato mode to standalone mode is a bit iffy too, especially if you’re using it as a back-up. And weirdly, it kind of looks unfinished – no decal to guide you around the black matt surface a few unlabeled switches and buttons… You certainly need to learn your way around its surface (and its “shift modifier” functionsa) to use it well, especially in the dark. But if you’re an experienced DJ, you want to add some great FX to your DJ sets, you use Serato and like the idea of having a portable/backup controller, or you like the idea of having a standalone mixer for mic or line use with built-in hardware FX, or indeed any of the above, then the curious, diminutive but ultimately smile-inducing Korg KOASS DJ may well be for you. I have this controller and used it a couple of weeks ago. Two gigs using the Kaoss DJ and it worked like a charm. Did you use the FX at all? Anyone know if you can use the FX only on individual channels or is it only on master out? Please share the custom TSI with us. Thanks for your comments. Very informative. Is there any chance you can send me your TSI file (jolyon18@hotmail.com)? I have a bug with mine where there is no cue headphone volume working and am getting no response from Korg (very frustrating).